Sovereign EP Pike Flies: Made from a mixture of the latest artificial fibres, deer hair and premium grizle hackles. These flies weigh barely 1 1/2 g, hold next to no water in flight and can be presented easily on a 9#wt rod. All patterns have of course been field tested and the results were extremely satisfying. Tied on a Sakuma Manta, partially forged, wide gape, chemically sharpened, high carbon hook with a micro barb and a mono weed guard. 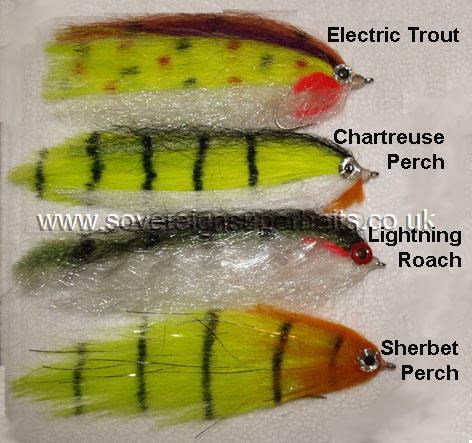 EP Pike Flies: Here we have a selection of around 100 EP Pike flies that never made it into full production. Each one is totally individual; 95% are tied on Sakuma Manta 6/O’s and have weed guards. A couple are tied on Mustad W3369A 3/O’s with builtin spring weedguard and a handful are on larger hooks up to 8/O, all of which are easily identifiable. All patterns have caught pike and were tested on the Thames, originally tied in batches of three, these being the control / reference that never got wet, but for one reason or another, usually complication of design or expense to reproduce didn’t make it into full production. 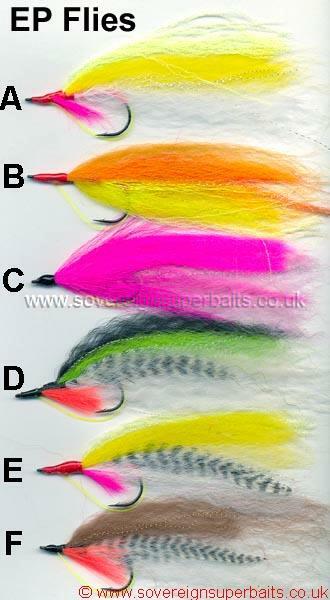 Neon EP Flies: New for the 2015 pike season, a small range of outrageously loud, neon bright, EP flies. These all average 6 1/2" in length and come on a 4X 6/O O'Shaunessy pattern stainless hook. Despite their size they cast incredibly well and really come alive in the water. Misser Froggy: This is one of the best frog imitations we have ever seen. It is obviously a top water / dry fly made of spun and stacked deer hair. It casts really well, can be positioned in the middle of lily pads and slowly twitched out due to its weed guards. 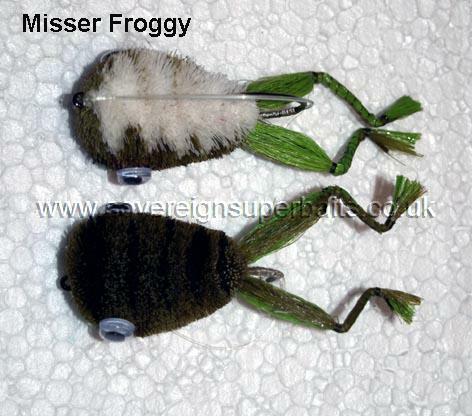 A superb fly for spring and autumn when the frogs are entering or leaving the water. It measure around 3 1/2" in length.